Its finally here, the VERY LAST DAY you can order from the 2011-2012 catalog. Don’t forget to double check your wish lists against the retirement lists so that you don’t miss out on something you’ve been waiting for. You can shop in the online store, or contact me at jennifer@nwstamper.com to place your order. I’ll be checking email through midnight tonight so I’ll be able to get all the last minute requests in. Get them before they are gone! Items are selling out so don’t miss out! Ever have one of those patterned papers that needs space to show off? Well, when playing with my Patio Party designer paper that is coming out in the new catalog, I really liked this print but it just doesn’t show off very well in a small piece. So when I found this sketch, I thought it would be perfect for this paper! The lanterns reminded me of a party, so I grabbed my new Make a Cake stamp set to help finish it off (and every cake needs a little bling, don’t you think). I also have my Whisper White stitched grosgrain ribbon as an accent. I have to say, it doesn’t really show up in pictures, but the stitching is a nice touch to just make the ribbon a bit more interesting. And yep! Both of these (the ribbon and the paper) are available in my New Catalog Product Share along with the Stitched Satin ribbon and In Color Dahlias! Need a copy of the 2012-2013 Stampin’ Up! catalog? Click here! The New Paper and Ribbon Shares are Coming! I finally sat down with my new catalog and decided to put together some product shares for some of the new, cute items in the catalog. I don’t know about you, but I think it is so much nicer and easier to figure out which papers and ribbons I really love when I can see the samples in person, plus I always love having lots of options without having to pay for all of the full packages! This year, I am offering a few different product shares to help you get a big variety of designs to play with for a fraction of the price. Check out your options and let me know if you want to sign up for one or more! Get a 6×6 piece of EVERY designer paper in the new catalog. There are 14 packs with 6 designs in each… that means you get 84 different designs in your paper sampler. If you bought each paper pack individually, it would be $158 plus tax and shipping! I LOVE this new ribbon. Get 2 yards of each of the 5 new In Colors… so 10 yards total! It would cost you $44.75 plus shipping and tax to get all of these colors yourself. get the coordinating In Color Dahlia embellishments to go with your ribbon. You get a 1/2 pack of these cute little resin flowers accents to go with your ribbon… that is 10 total flowers. Get 2 yards of each of the 10 colors of this new ribbon style. That means you will have 20 yards total to play with. Individually, it would cost you $49.50 plus shipping and tax to get these ribbons. I’ll be mailing your shares out via USPS Priority mail, so I will be able to package multiple share options together for one low shipping cost! I’ll be putting in my first order for these products on June 1st, so save your spot now so you can be one of the first to get yours! 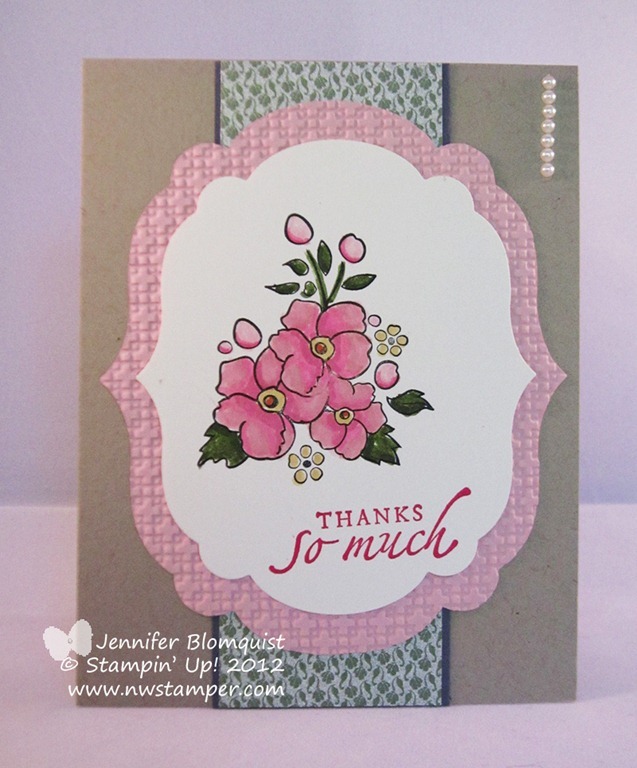 Thinking of signing up to be a Stampin’ Up! demonstrator? Join my team between now and June 14th and receive your choice of one of the ribbon product shares above! This is a perfect way to get ribbon samplers to show your new customers; or to have a variety of products on hand to create your own products and samples with! 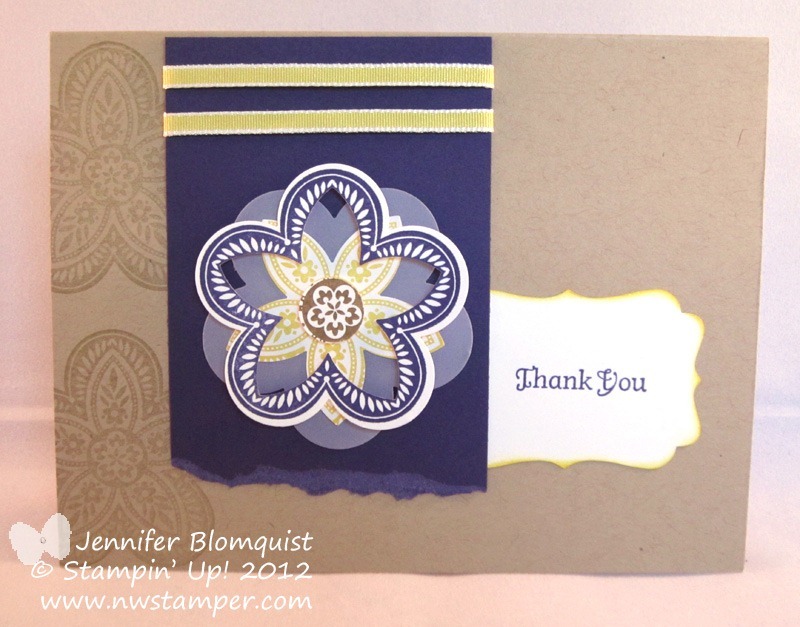 Check out all the details on being a Stampin’ Up! demonstrator and the starter kit here – Join My Team. The end of a catalog year always leaves me with stamps and accessories that I’m so happy are going to continue being available… and stamps that I’m sad are going away. This card has both! So, I made this card to send to a customer to thank her for a recent order and it was a great excuse for me to try blending and coloring using markers. I used 3 different pinks to color in my flowers – Pink Pirouette, Regal Rose, and Blushing Bride markers, and layered the colors and then did additional blending with my Blender Pen. I started by coloring in the entire petal with the lightest pink, then did some shading with the middle tone pink (Blushing Bride), and then finished out with accent highlighting with the darkest pink (Regal Rose). I think it turned out pretty well, huh? The rest is pretty straightforward loving with my Big Shot (framelits and the lattice embossing folder). Add some Paisley Petals designer paper and some basic pearls. What stamp set will you miss the most when they retire in a week? I feel almost selfish, I ordered some of the new sneak peek products earlier this month and while I’ve been getting to know them; I haven’t done much sharing (aside from the In Color sampler bookmarks I included with mailed catalogs). Well, I thought I would change that and share a card I made to play with a bunch of new things… can you guess how many new items are in this card? So, what is your guess? If you said 5 items, I’d say nice job! If you said 6, then you are exactly right! 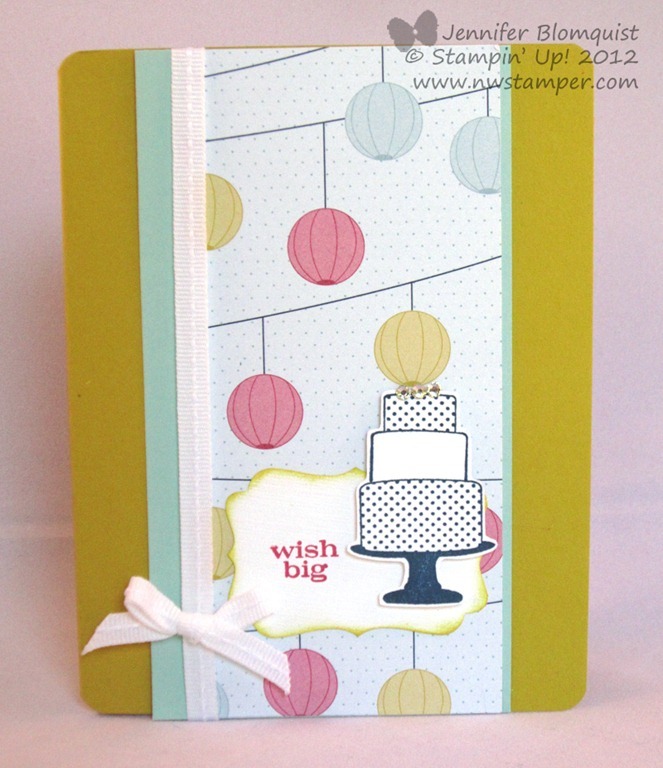 First off is the super cute paper called Patio Party that features the new In Colors. I thought the banners design was cool enough on its own that I wanted to let it shine by being the focal point of the card. Next, I added some of the new stitched grosgrain ribbon (Daffodil Delight in this case) for a border trim and to help my sentiment pop! 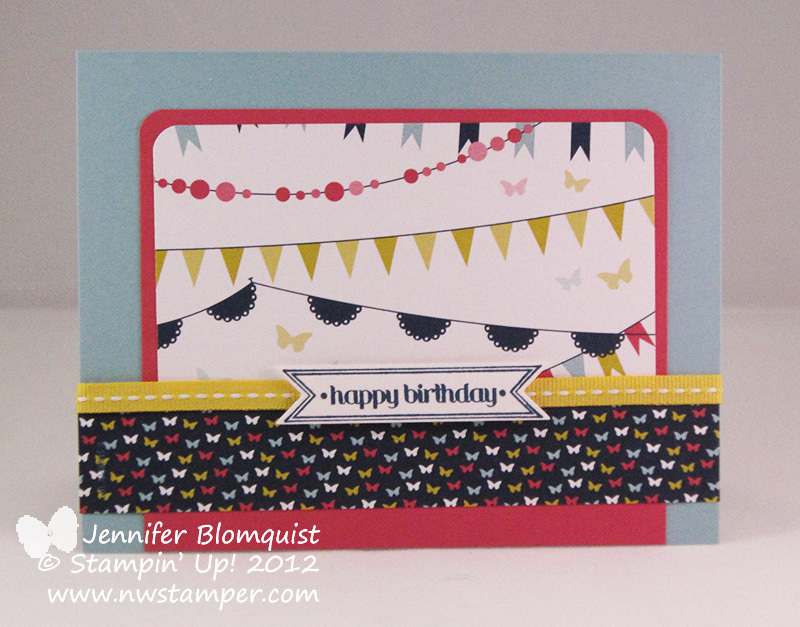 Ok, #3 – the stamp set called Itty Bitty Banners. Now, I like sentiments and banners but I wouldn’t be loving this set as much if it wasn’t for the fact that there are new framelits to exactly match the stamps!!! woo hoo!!! So, that is number 4, the matching Bitty Banner framelits! I love how easy it makes my job at cutting out the sentiments. So, that leaves 2 more new things to spot. Well, they are new In Colors… first is the pink paper matting my paper in the middle of the card – it is the new Primrose Petals and it is super pretty. And finally, I stamped my sentiment in the new blue called Midnight Muse. I know, it is hard to tell but it is a really nice blue color. Not quite as dark as Night of Navy but deeper than Island Indigo or Not Quite Navy. Well, all of these things are available starting June 1. but… did you know you can get them earlier than that? Want to get these items now? Did you know, that if you order the Stampin’ Up demonstrator starter kit (your choice of $125 worth of products for only $99 plus free shipping!) now, you are able to fill your starter kit with sneak peek items. 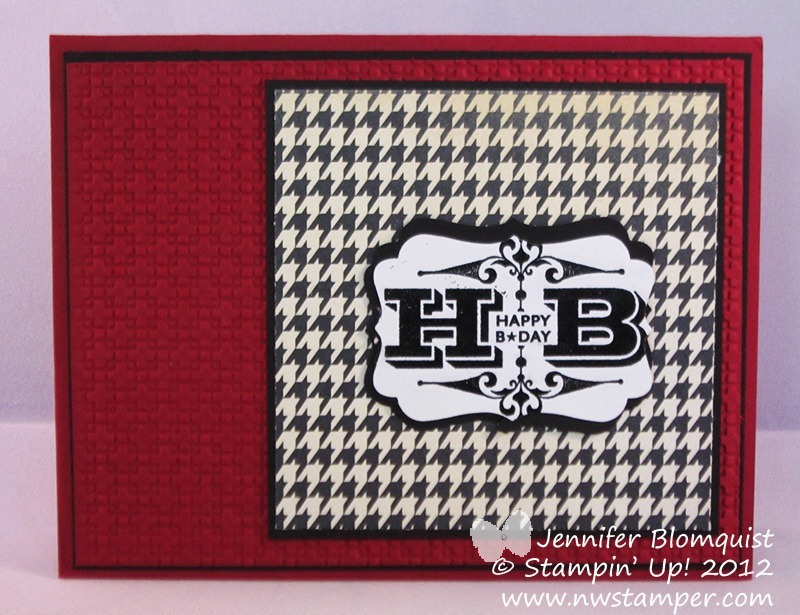 This includes multiple stamp sets, accessories, paper, and even the new firm foam ink pads in all of the Stampin’ Up! colors! Oh, and did I mention that the starter kit ships for free? It is a great deal and a perfect way to start enjoying the benefits of being a demonstrator now! In fact, if you sign up online, you will have access to the demonstrator website most likely within the hour. How fun is that! If you have questions or would like to learn more, shoot me a note at jennifer@nwstamper.com and I’d be more than happy to fill you in on all the details. Or if you are ready to go, you can start building your kit by signing up online now. If you haven’t seen, I’ve started trying to create videos about stamping topics or project how-tos (you can check them out on my youtube channel – www.youtube.com/northweststamper). I’m only just getting started, but I was recently asked to create a video on how to make the dimensional flower using the Triple Treat Flower stamp. 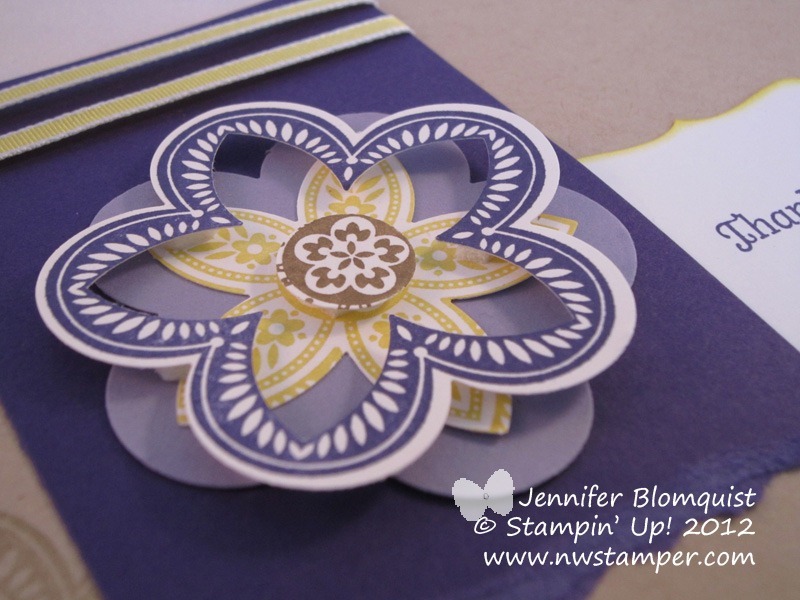 So, I wanted to share the video today along with the card I created using the flower sample from the video. This is super easy to make and just requires having 3 punches: the Fancy Flower punch, the 5-Petal punch, and the 1/2” circle punch. If you want to see how it is done, check out this video where I walk through making it! Don’t forget, this stamp and the Concord Crush paper and ink are retiring in 8 days! So, if you haven’t gotten yours yet, grab it now before it is gone! Anyway, I loved how striking it was and thought it was a great masculine card and so I wanted to share it with you. The stamp and the paper are retired from last years catalog – Engraved Greetings stamp set and Love Letter designer paper. But the cardstock, embossing folder, and punch are all current. 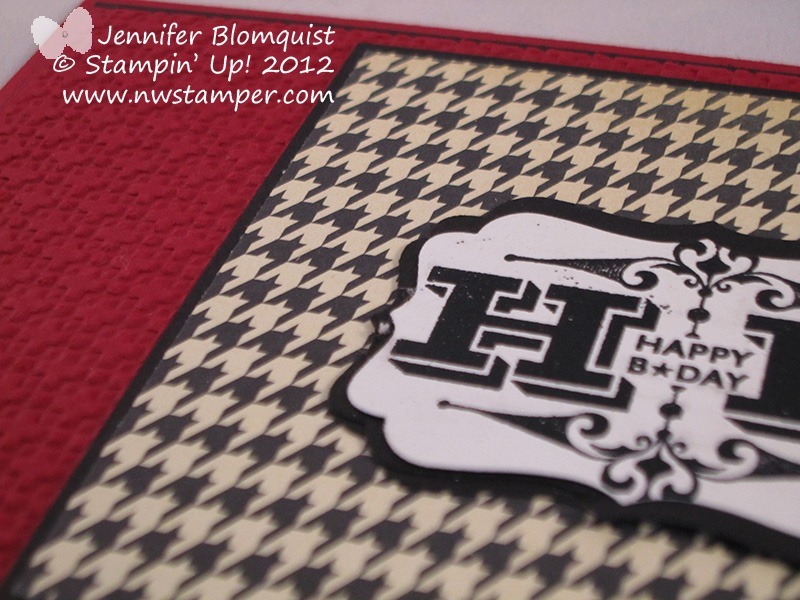 And the embossing, she heat embossed the stamp image with black embossing powder which made it look even cooler! (I tried getting a close up to show you but its still hard to see). This just goes to show that a card doesn’t have to be fancy or complicated to be a striking and fabulous card, huh?